An incredibly fresh, flavourful & yet simple Pear Walnut Salad which brings together vibrant sweet & savoury flavours with wonderful textures & colours. What a weekend. Paul went off to Vancouver with a friend to ride the Gran Fondo and I stayed in, cooking up a storm and hiding from the horror that is Ribfest which was going on all weekend. The smell was sickening and it seems the whole neighbourhood was entranced by it. Thousands upon thousands of people attended. All I could think about were the countless animals who lost their lives for this awful festival of what can only be described as human greed. So to take my mind off that, my weekend ended up being mainly filled with cheesecake creating (OMG..If you love cheesecake be excited..be very excited…it is seriously the best vegan cheesecake I have tasted and it is coming to the blog soon), homemade Digestive Biscuits (because I needed them for the cheesecake), this awesome salad plus three other fantastic recipes, two new videos, my new favourite tipple, Kraken Black Spiced Rum with Phillip’s Craft Brewed Sparkmouth Ginger Ale and a marathon run of The Great British Bake Off. If it wasn’t for the stench of ribs wafting through my windows it would have been pretty perfect. I don’t watch much television but I do love The Great British Bake Off. I had resigned myself to the fact I wouldn’t be able to watch the new series as it isn’t shown on Canadian TV. Cue this weekend, when I was exploring YouTube after a long day of cooking and happened to find it there. How happy was I? It’s not a vegan show (are there actually any vegan cooking shows? ), but it’s fun to watch and gives me lots of inspiration. After my marathon Bake Off session I am now itching to have a go at veganizing Dampfnudel. Don’t worry, I hadn’t heard of them until this weekend either but watch this space…You might just be getting familiar with them soon……. As well as being inspired to cook Dampfnudel, I was inspired by the biggest, juiciest, brightest red pears I have ever seen at my local green grocer. I actually had another recipe planned for today but ended up working on this Pear Walnut Salad with Maple Cinnamon Dressing as soon as I got them home. It was made, photographed and eaten for lunch amongst the chaos that was my kitchen. When I say “cooking up a storm” I really mean it. I should post a picture of the aftermath one day…………. Out of that chaos came this Pear Walnut Salad with Maple Cinnamon Dressing. It is just full of beautiful flavours and colours. Peppery arugula, sweet juicy pears, crunchy candied walnuts and a simple maple cinnamon dressing. The combination of flavours and textures is just delicious and the red skins of the pears look so pretty against the deep green arugula. Of course if you can’t get red pears, then use green. The flavours will be the same, it just won’t look quite as pretty. This Pear Walnut Salad comes together so quickly. The only cooking involved is making the candied walnuts which takes literally five minutes. The pears are left completely as they are. They are too good to mess around with. 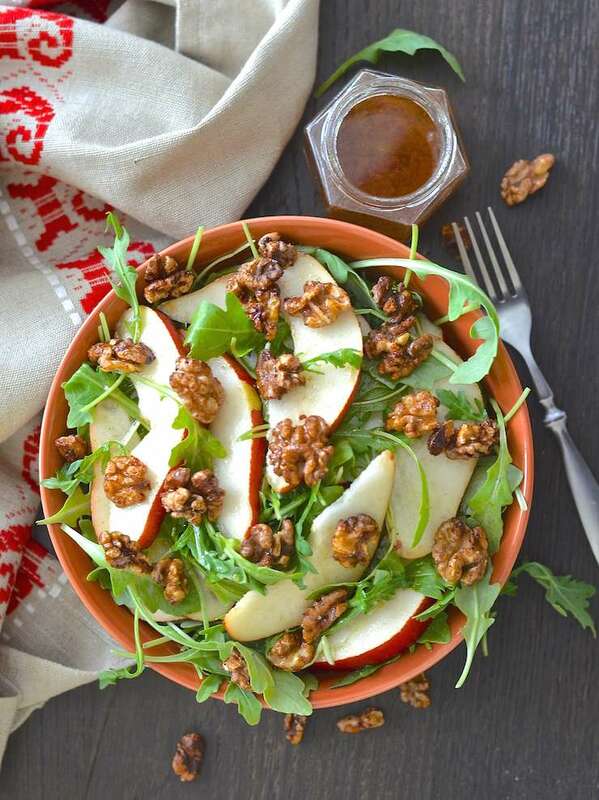 Their sweet juiciness works brilliantly with the peppery arugula and the sweet crunchy walnuts, and their flavour seeps out and into the maple cinnamon dressing. It’s just a dream to eat. 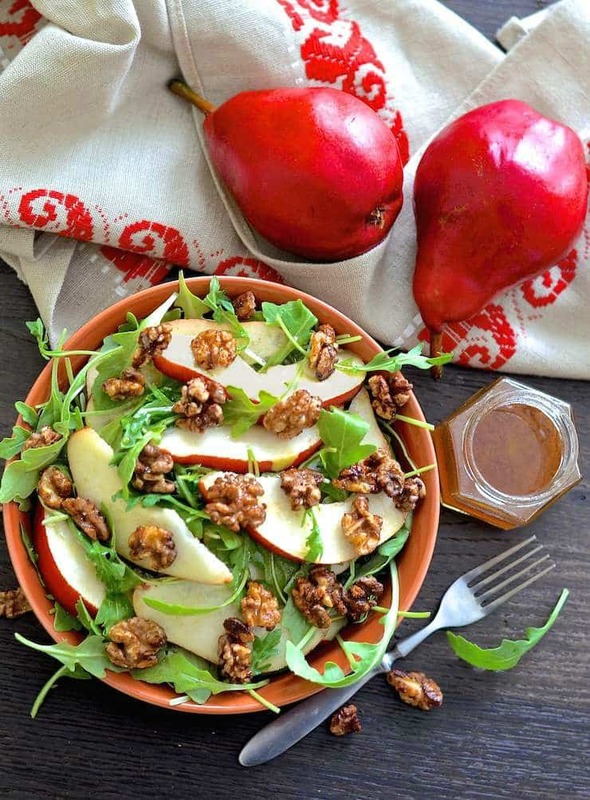 You can eat this Pear Walnut Salad as an entree or a side. If you feel the need to bulk it out a bit then it is great served over a bed of green lentils that have also been coated in the dressing. 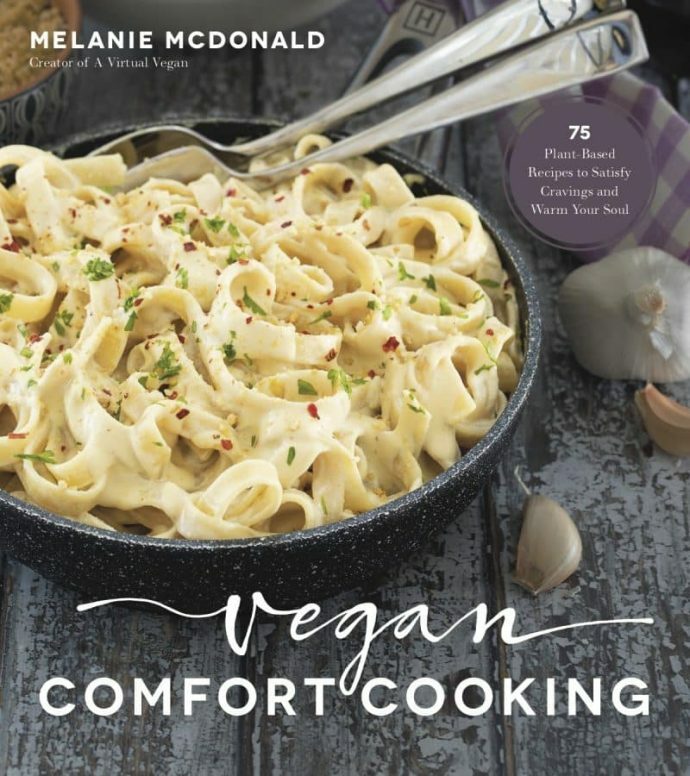 It would also be wonderful with veggie burgers, pizza or pasta. Or just serve it with some crusty bread or a side of soup. Anyway you do it, I assure you it will be wonderful! If you try this recipe ( or any of my others) let me know what you think in the comments section below. Be a star too and tag me @avirtualvegan or #avirtualvegan on Instagram so I can see! Add all of the dressing ingredients to a small jar. Put the lid on and shake well. Wash the pears gently and half them lengthways. Remove the cores with a teaspoon then cut each half into long thin slices. Sprinkle over the cooled walnuts. I made this for Thanksgiving and it was a perfect compliment to a heavy meal! I did add some scallions and we used spinach to make a little more little kid friendly. That’s great Megan! So glad you enjoyed it. And I totally get what you mean about arugula not being kid friendly. My son is 17 and still won’t eat it! This looks sooo delicious! 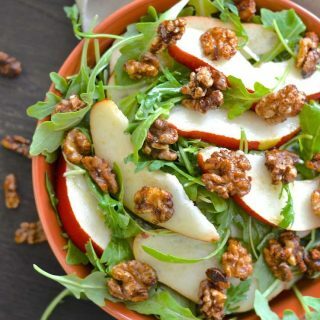 I love the walnuts and arugula in this, I think arugula tastes so amazing with so many things and this has me drooling. That dressing sounds so flavorful and delicious, too! Thank you Brandi. Arugula is one of my favourite salad leaves as it has so much flavour. It pairs so well with the sweet flavours in this recipe! I LOVE everything about this salad. Such complimentary flavors from the bitter walnuts, to the sweet maple, crispy pears and spicy arugula! Thank you Alisa! I’m not usually a big lover of salads but I could eat this one every day! Ugh Ribfest :( Makes me sad to think about. It sounds like you had a PRODUCTIVE weekend! Damn girl. Thanks Kimmy :O) I did have a very productive weekend! You must try to find some red pears. They are so pretty and it might be psychological because they are so pretty, but I’m sure they taste better than brown or green ones. I love everything about this salad! That dressing sounds amazing. I had red pears for the first time, the other day, and was not disappointed! Thank you Jackie. I think I have eaten my weight in red pears recently! I’m going to need to double the candied walnuts so that I can snack on them while I’m making the rest of the salad! This salad sounds delicious! I love all those flavors. That dressing sounds so flavorful and perfect for the pears and walnuts! Thank you Sophia. The flavours all work so well together. It’s a dream to eat! I think perhaps you made this salad just for me. 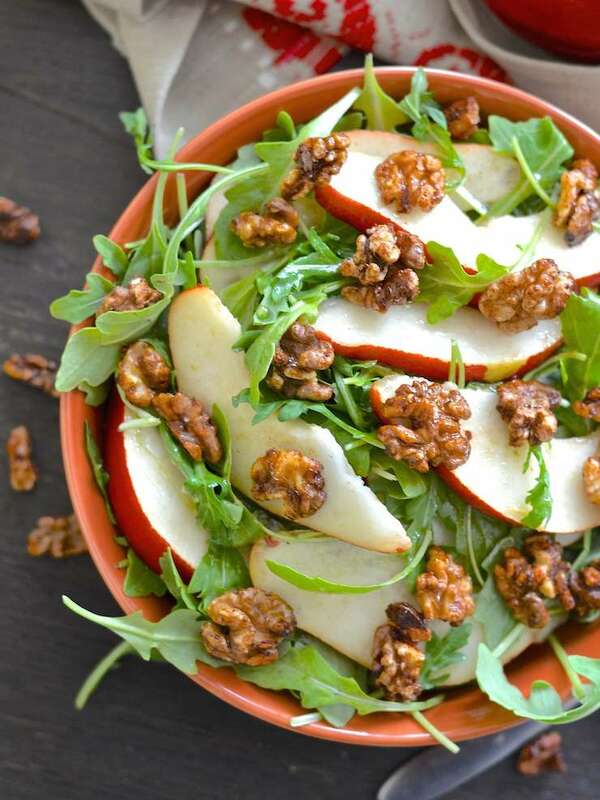 Arugula is my favorite green and I LOVE pears and walnuts together. Loving that maple cinnamon dressing too. So yum! Oh I did! ;O) Arugula is my favourite green too. It’s got so much more flavour than lettuce hasn’t it? It’s pepperiness works so well with the sweet pears and maple in this salad. So perfect for fall! Can’t wait to try it! Yuck! I can only imagine how awful the smell must have been. This salad is one of my favorites. I love pears and walnuts together. Perfect for fall! Ha ha! I glanced at your comment and saw “yuck”, thinking you were talking about my salad!!!! lol Yes the rib smell was ‘yuck”. I am so glad it’s over! 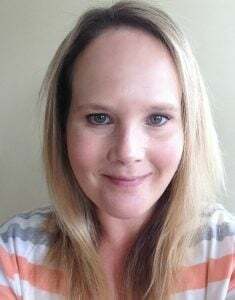 So well put…it absolutely blows my mind that here in the southeastern US, ie: “The Bible Belt”, I am surrounded by people who preach about maintaining a strong moral fortitude and ethical responsibility, yet they turn a blind eye to the abuse and exploitation of sentient creatures who suffer at the hands of humans. The selective compassion and empathy, reserved for only some not all, is so, so sad. OOH love the candied walnuts in this! And I’m excited to see your veganized Dampfnudel! Candied nuts are awesome aren’t they? Especially in salads. You might be waiting a while for the Dampfnudel….I think it will take much trial and error! Thank you so much Melissa. 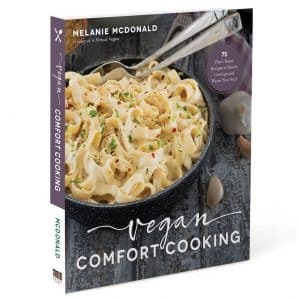 Maybe one day Ribfest will be taken over by Vegfest….How great would that be? Candied walnuts are my fave! This looks delicious and perfect for fall! Thank you Sarah. And yes, candied nuts are awesome! This salad sounds perfect for fall Mel! I watch the Bake Off too, and if you can veganize Dampfnudel I’ll be so impressed! The main reason I wanted to comment on your post though is I saw in your email that you didn’t like the light for this. Just before I read that, I was literally thinking to myself whoa, Mel’s lighting is so sophisticated and delicate in these pics! I love it! I know it’s all subjective but..I love these pics and think they’re some of your best. :D. Really???? That’s made me feel a whole lot better. Thanks Gin :O) I was that close to not publishing it. I think there is too much bright white light bouncing off the pears. It must just be because they are so white and juicy that it kind of reflects back off them. Perhaps I’m too over critical? If I had lightroom or photoshop I might have been able to fix it but I don’t. On one photo I used the fake tan function in picmonkey in desperation. It actually darkened the white up a bit and kind of helped! lol Applying fake tan to pears…I really have lost it!! And as for Dampfnudel…I’m going to have a damn good go! Thank you for stopping by. It’s cheered me up and made me see the pics in a new light (excuse the pun)!